August 5, 2000 Dudley Randall, founder of Broadside Press, died. Randall was born January 14, 1914 in Washington, D. C. but raised in Detroit, Michigan. At the age of 13, his first published poem was printed in the Detroit Free Press newspaper. After serving in the military during World War II, Randall earned a Bachelor of Arts degree in English from Wayne State University in 1949 and a Master’s degree in library science from the University of Michigan in 1951. 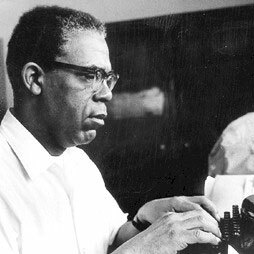 In 1965, Randall founded Broadside Press which over the years published many leading African American writers, including Sonia Sanchez, Gwendolyn Brooks, Haki Madhubuti, and Sterling Brown He even published his own book, “The Black Poets.” Poems written by Randall include “Ballad of Birmingham,” “Booker T. and W.E.B.,” “Roses and Revolutions,” and “The Profile on the Pillow.” In 1981, Randall was named Poet Laureate of the City of Detroit. ← August 5th in African American History – Oliver White Hill, Sr.